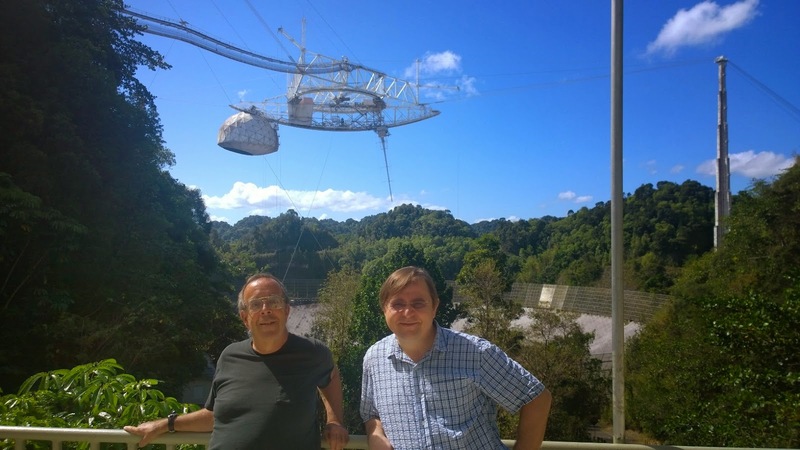 We had an opportunity to spend couple days in Puerto Rico last week and I wanted visit the Arecibo Observatory that is located about 1 1/2 hours drive from San Juan. I did some research and found out that the visitor center is open on Sundays. After reading a very interesting QST article about 432 MHz EME moon bounce ham radio event I decided to send an email to Angel WP3R to find out more details on ham radio related activities in the Arecibo ham radio club station KP4AO. 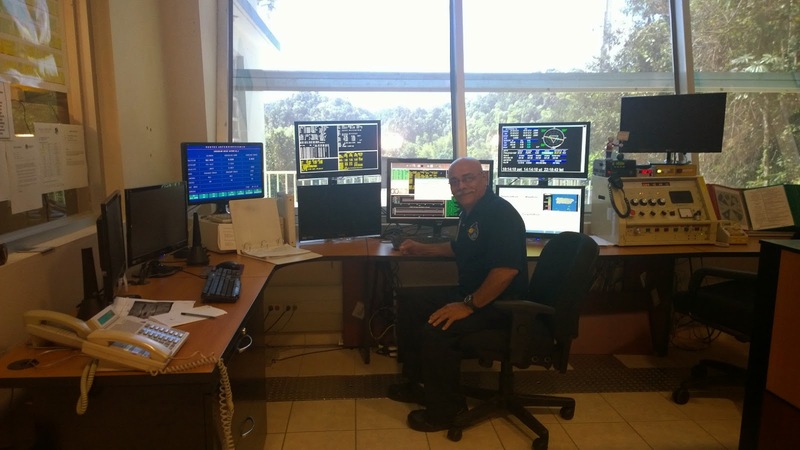 I was positively surprised to get a quick reply from Angel, and even more happy that he was willing to organize a visit for us to see the Arecibo control room and the antenna system. After a few email exchanges our visit was confirmed for Sunday March 31st. We left our hotel in San Juan at 8 AM on Sunday morning and arrived to Arecibo around 9:30 AM. Norberto Despiau and Dana Whitlow K8YUM greeted us upon our arrival. Dana gave us an excellent introduction to the observatory. He started by explaining the design features of the 1000 ft diameter main reflector. It has spherical shape and is constructed from some 38,778 perforated aluminium panels. These are mounted with +- 2 mm accuracy making this antenna system usable up to 10 GHz frequency band. There is a moving platform 500 ft above the main reflector suspended by 18 cables from three towers surrounding the dish. This design enables to track targets +/- 20 degrees off from the zenith. The two main antenna systems visible on the moving platform are for both transmitting and receiving signals. See Figure 1. The long pole with circular tapered rings is the antenna optimized for 430 MHz band. The white dome contains secondary and tertiary reflectors as well as 6 different antenna systems for various bands between 430 MHz and 10 GHz. These can be swapped in 6 seconds from the control room. The 18 cables holding this 100 ton platform up in the air are expanding during hot sunny days and contracting during night. To maintain antenna in focus there is an automated system keeping the tension stable. We saw the system as we walked down underneath the main dish. Dana also explained the importance of keeping some vegetation growing under the main dish. Since the dish is over a natural karst sinkhole it would fill up quickly with mud without vegetation removing the moisture. Keeping the vegetation under control is another challenge. Cutting weeds on deep slopes of the sinkhole under the main dish is a difficult job. 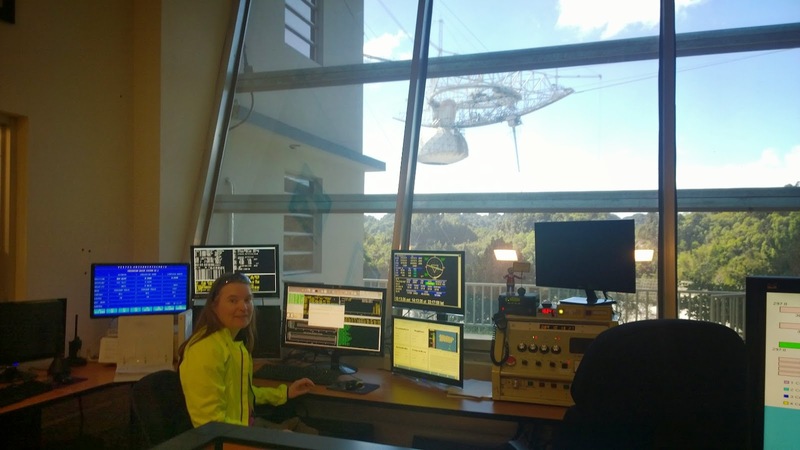 Arecibo Observatory has capability to provide planetary scale radar imaging. They have 2 powerful transmitters and combined with very high gain ( 72 dBi at 2.38 Ghz) the effective radiated power can be up to 20 TW at 2.38 GHz. This power is needed to produce detailed radar images from planets, moons and asteroids. The radar transmission can last for several minutes and is modulated with pseudorandom noise. Signal processing and correlation methods are used to extract data from received echoes. Arecibo can track objects up to Saturn orbit in our solar system, beyond that the echoes come back too late to fit in the observation time window. 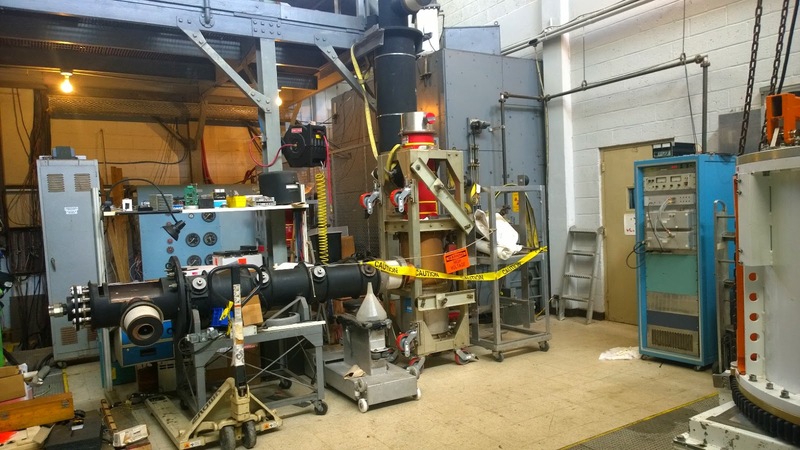 Dana took us to the transmitter room where they had two huge klystron amplifier tubes under repair - black horizontal tube produces 1 MW CW power at 430 MHz and red vertical klystron 1 MW at 2.38 GHz. (see figure 2 below). The grey big box at the center is the 430 MHz transmitter. 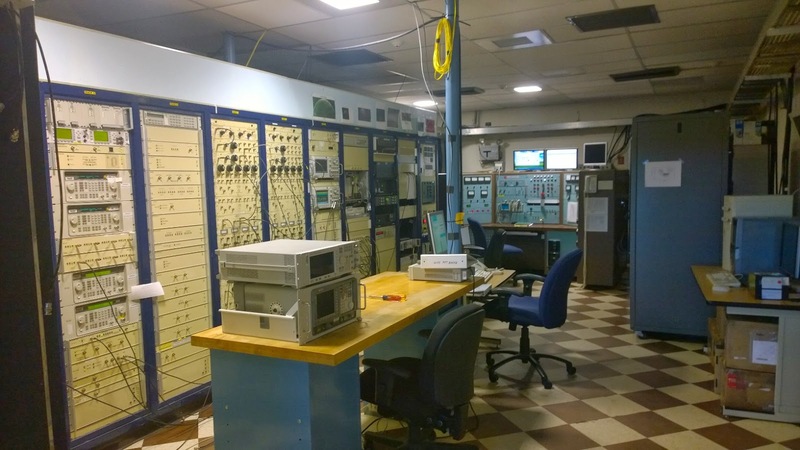 Figure 3 shows the control room where the antenna system is operated. In many cases both research and antenna tracking is done remotely over the Internet. The staff is monitoring the system to ensure safety and address any issues. One of the biggest problems is radio frequency interference (RFI). Receiver pre-amplifiers are kept cold at 15 K with liquid helium and they are very sensitive so even a tiny RFI source creates a problem. Dana explained that they have a specially equipped van to track down RFI sources, often more than 10 miles away from the observatory. They are also coordinating with air traffic control radar systems during some especially sensitive observations. Received signals are amplified at the antenna platform and brought to the control room either via low loss waveguides or via optical fibers. Figure 4 below shows racks full of advanced receivers and spectrum analyzers. As many principal investigators are operating the radio telescope remotely the digitized signals are available via the Internet. Arecibo has 250 Mbps link which is burstable to 500 Mbps rate as needed. The blue rack on the right side is part of world wide VLBA system (Very Long Baseline Array). It has large disk arrays that are frequently swapped and shipped to central location for analysis. In nearby villages the Arecibo Observatory is called "El Radar". Locals are convinced that the staff at the observatory are talking to aliens on frequent basis. In fact Norberto instructed Dana to show us everything "except the bunkers where they keep the aliens" with a smile on his face. There may be some truth in these beliefs. Arecibo Observatory was used in SETI (Search for Extra Terrestial Intelligence) project in 1999 to collect data from nearby stars. It was also used to send the famous Arecibo message (see Fig 6.) designed by Frank Drake and Carl Sagan. The message was sent on on 16 November 1974 and it was aimed at the globular star cluster M13 some 25,000 light years away. Dana did not confirm or deny having received any response back yet. On the other hand he has been working at the observatory only for 7 years. We may not know the answer before the next 49,960 years. I would like to thank Dana, Norberto and Angel for organizing this very enjoyable visit to the observatory. Special thanks to Dana K8YUM who spent 3 hours of his Sunday morning with us - very much appreciated.